Book review #3 of 2013! I am too excited about this book to even give the lengthy introduction that I normally do. Just one thing I wanted to make a note of is that I encourage you to check out your local independent booksellers! 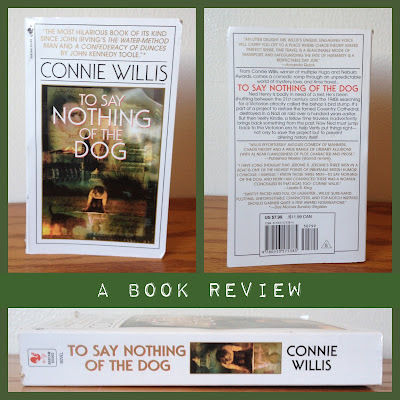 I went on the hunt for To Say Nothing of the Dog at multiple Barnes & Nobles and could not find a single Connie Willis novel (amongst other authors I was in search of as well). I was finally able to find this book at a local bookseller and though it was completely new, I got it for $3.99 as opposed to the original $7.99 price. Even if you don't find a discount, its selection can still surprise you like it did for me! "Ned Henry is badly in need of a rest. He's been shuttling between the 21st century and the 1940s searching for a Victorian atrocity called the bishop's bird stump. It's part of a project to restore the famed Coventry Cathedral, destroyed in a Nazi air raid over a hundred years earlier. But then Verity Kindle, a fellow time traveler, inadvertently brings back something from the past. Now Ned must jump back to the Victorian era to help Verity put things right- not only to save the project but to prevent altering history itself." To put it simply, I think To Say Nothing of the Dog may be one of my favorite books of 2013. It's early in the new year to make this conclusion, but this book just has an abundance of things going for it, which I will try to list for you. First of all, the characters in Willis' novel are alive and incredibly likable. The story is told from the first person POV of Ned Henry and he is hilarious. I love reading all his thoughts. For a ~500 page book that is told in the first person, indifference to the narrator can make finishing a book a challenge. And Ned made this book incredibly fun to read. His personality is simply charming and you want to know what happens to him. This next point has to do with characters as well, but aside from Ned, the remaining cast of characters are full of lively personality. Even the dog, Cyril, and the cat, Princess Arjumand (don't judge her by her name), are full of quirky personality. I could have read pages of interactions simply between the two. Each character added something new. Secondly, the writing was well done. Oftentimes with first person narration, the writing is done to fit the way people think to themselves- simple sentences, often filled with inside-jokes and humorous anecdotes. Willis includes the humorous anecdotes but her sentences contain a complexity to it that keeps the novel from falling flat and feeling skeletal as far as style is concerned. Third is plot. I have read a few time travel narratives, the ones I can recall are The Time Traveler's Wife (Audrey Niffenegger), which I read at least 7+ years ago, and The Time Machine (H.G. Wells) which I read about 2 years ago. Each had a twist that made it unique, but I think this one has to be my favorite of the 3. I loved the notion of incongruities and that time machines have their ways of fixing little mistakes the travelers make when they go back in time. The whole thing was just incredibly clever, and though I was able to predict a small piece of the ending by approximately halfway through the novel, there was plenty more that I wasn't able to predict at all. Plot, character, and style. To Say Nothing of the Dog has everything going for it. I don't consider myself a huge sci-fi nerd (I consider myself a bigger fantasy fan), though I have gone through my phases (I love Battlestar Galactica), and I really loved this book. I will definitely be seeking out Connie Willis' Doomsday Book! Oh!!! Your review has me interested in this! You briefly mentioned this story no? The title made me anticipate a sad story about a pet but that's me being me. The fact that Ned is hilarious (probably not Hassan level?) has me putting this on my list!